Albert Chen was used to receiving delegations and dignitaries. As founder and CEO of Carmel-based Telamon Corporation, many Chinese investors would come to him first to seek advice on how to do business within Indiana. In 2010, Mr. Chen decided to set up a business-focused non-profit to help facilitate these opportunities. 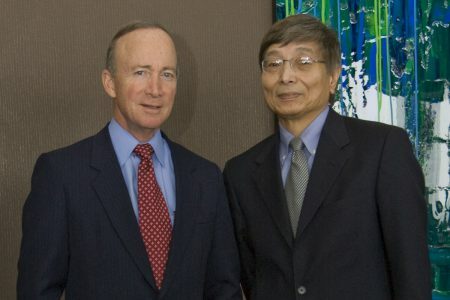 A year later, the America China Society of Indiana was up-and-running and had a kick-off event with then-Governor Mitch Daniels. By 2013, ACSI became fully independent and expanded its relationship with the state of Indiana to aid with bilateral investment opportunities along with inbound and outbound delegation assistance. With a diverse Board of Directors and a half-century of Corporate Members, ACSI has grown to be the catalyst in Indiana-China business relations. The Mission of the America China Society of Indiana is to strengthen the Indiana-China business relationship, create mutually beneficial business opportunities, and foster a China-friendly business environment. ACSI will be a leading force, advocate, and catalyst for new business development opportunities in Indiana and China.